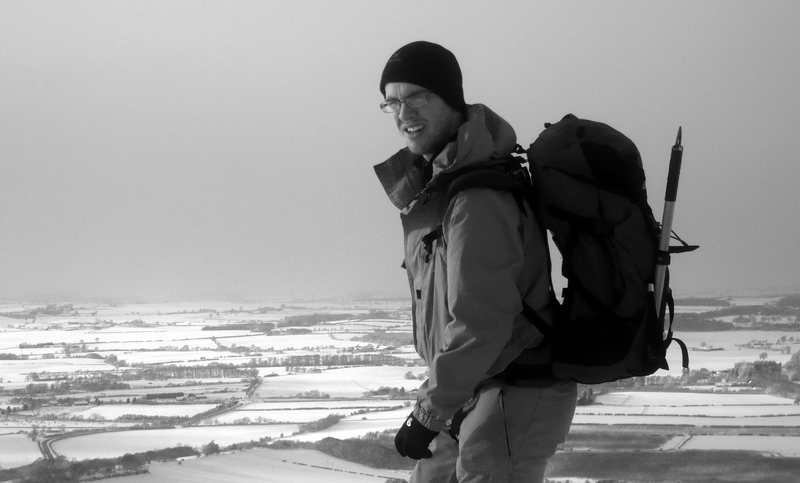 It’s freezing here at Gearandmountains HQ: Leeds has suddenly got very cold. With this in mind, I’ve a topical post. It’s something I was asked a long while ago by a guy via email, and he wondered whether carrying a hot drink in winter had any real benefit. Surely it does? It’s hot, you’re cold – what’s not to like…? It’s -10 °C, you’re in the Cairngorms. Only, you think you are, but it just so happens you can’t see anything because you’re in a whiteout. Your mate pulls something out of his bag. Haribo? Yes please. Free from Wiggle? Wow, they taste even better. Having gobbled the Haribo he offers you a hot flask. Free from Wiggle? No, not this time. However, oh wow that tastes good… but will it do you any good? So, are hot drinks beneficial in the cold? Google’s answer: I googled this conundrum to see what would come up and you get some entertainingly bad answers, such as “i was told a cold drink was better because it warms up inside you where a hot drink goes cold inside you”. This sort of justification does not get past peer review. So, more work required. This guy could do with a hot drink. And possibly a facelift. My short answer: if you go back to the basics, that thermal comfort is a state of mind, any psychological help (ie. stuff that makes you feel better) is beneficial. Therefore, I’d say if you enjoy drinking hot drinks then go for it. They can definitely feel reassuring. My longer answer: From a physical point of view, to remain in thermal comfort you need to ensure you’ve no local cold spots, as well as a comfortable core temperature. If your throat, mouth, and lips, which are full of sensitive nerve endings, are cold then hot liquid on them will warm them up and feel good, unless you just burn them. There’s also research ( http://onlinelibrary.wiley.com/doi/10.1111/j.1748-1716.1973.tb05416.x/abstract) that shows that the extremities produce more heat when drinking a hot drink. Your hands and feet are full of nerves too, so warming your hands will definitely feel beneficial, especially if you need them to carry out dexterous tasks like unwrapping chocolate bars. Mmmm, chocolate. Anyway, first plus-point – hot drinks get rid of local cold spots. From a core temperature point of view, liquid is required to keep your metabolic processes ticking over and ensuring you keep making heat, so consuming either a hot or cold drink is beneficial in cold conditions. However, the effect on core temperature of drinking a hot, as opposed to cold, liquid is negligible – there just isn’t enough liquid. You wouldn’t heat up a bath-full of water with a single kettle of boiling water, so you’ve no chance trying to heat up your 150 litre body with 1 litre of hot tea. It would have to be 1 litre of lava or something, and that is not very tasty. Just ask any geologist. Hypothermia is not recommended to be treated with hot drinks (“A warm drink will not provide a signiﬁcant thermal beneﬁt to the body. The most important ingredients in a drink are carbohydrate additives that will fuel continued shivering” from http://onlinelibrary.wiley.com/doi/10.1046/j.1442-2026.2001.00172.x/pdf). This raises the other point that sugar (energy) intake is good for you when you’re cold. So, if you fill that flask full of seriously sugary gloop that’ll help you out. Mmmm, sugary gloop. So, thus far we’ve seen that a hot drink will warm some sensitive areas like throat, mouth and hands, but its overall effect on core temperature will be minimal. However, as the short answer suggested, a massive effect is mental: do you like drinking hot drinks? If, like most Brits, you’re addicted to either tea or coffee, getting your fix on the hill will make you feel better (You wouldn’t send a crack addict up a hill without some crack (would you send them up there at all?)). Hot drinks are a great comforter, and therefore, come winter, they’ve a place in many walkers’ and climbers’ packs. This enormous cornice caused us massive aggro. A nice hot drink would have been very welcome. 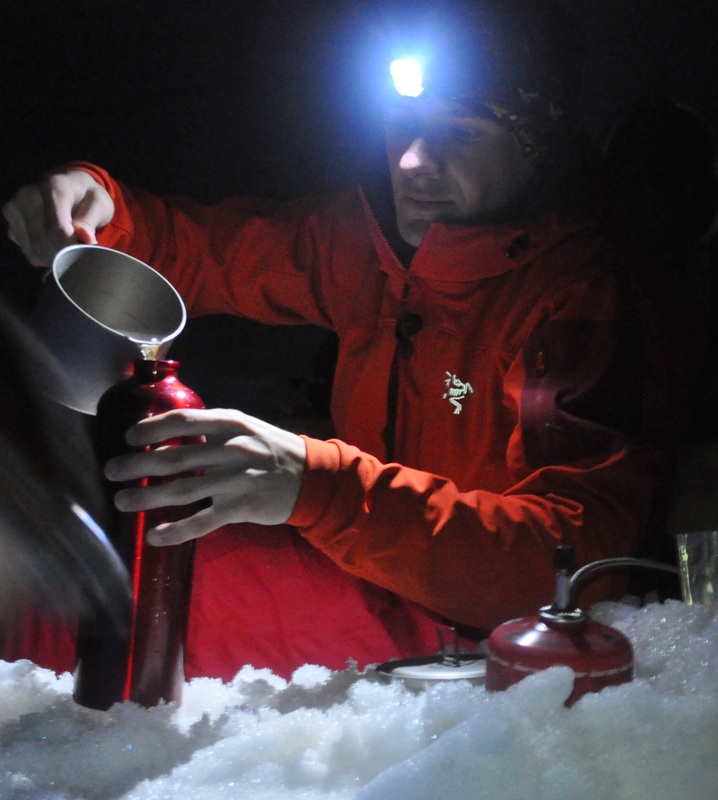 Hot drinks are a welcome part of any Alpine bivvy. In conclusion, carry that hot flask if you think it will help – on this one, the psychological effects outweigh the physiological ones. (Thanks to Dr M Morrissey, world-renowned thermal badboy, for his help on answering the original poser). 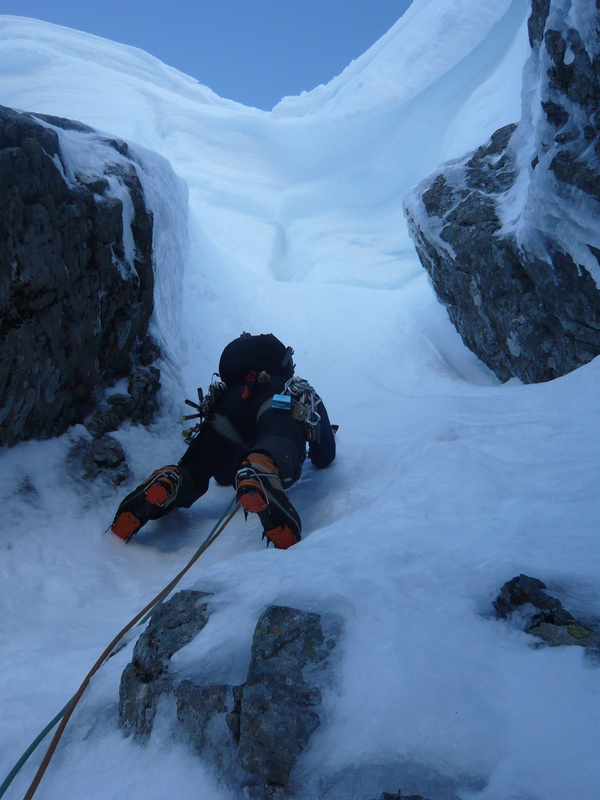 This entry was posted in Other, Thoughts on gear and tagged cold, don't believe everything on the internet, drinking lava, free wiggle haribo, hot drinks in winter, tea, thermal badboy, thermoregulation, thermos, winter, winter climbing, winter hiking by Matt Fuller. Bookmark the permalink. I never take a hot drink. Carrying the extra weight of a thermos the whole day just for a quick flush of warm fluid which is soon gone just isn’t worth it – not to say it wouldn’t be nice.